Holidays are one of my favorite times of the year, and not just because it means a few more days off from work. On holidays we gather with friends and family, and it’s almost always around a big table full of amazing food. It’s the food I look forward to most, because there’s nothing more fun than creating a delicious dinner for friends and family. This year I thought it would be fun to cook something a little less traditional and a bit more exciting, so I set out to create the perfect recipe for rotisserie prime rib. A few weeks back we wrote a blog about rotisserie chicken and how it’s a great way to roast your fowl. While chicken is definitely one of the more popular things to cook on a rotisserie, it’s definitely not the only thing you can roast on a spit. There are several types of cuts and meats that work well on the rotisserie. Things like leg of lamb, pork shoulder, duck, and beef roasts such as prime rib are all great candidates for this technique. Since prime rib is one of my favorite cuts of beef due to the flavor that comes from the marbling, I figured it would be the best candidate for a tasty new recipe for the holidays. Organic cuts of meat tend to be smaller in size. This isn’t necessarily a bad thing since prime rib has a relatively high price per pound. Buying organic gives you a certain peace of mind that what you’re eating is free from undesirable things like additives, antibiotics, growth hormones, or animal byproducts. A key part of choosing a good prime rib roast is marbling. In general, the more marbling you have in a piece of meat the more flavorful the roast will be. You’ll also notice a well-marbled piece of meat is more tender than a leaner or less fatty piece. 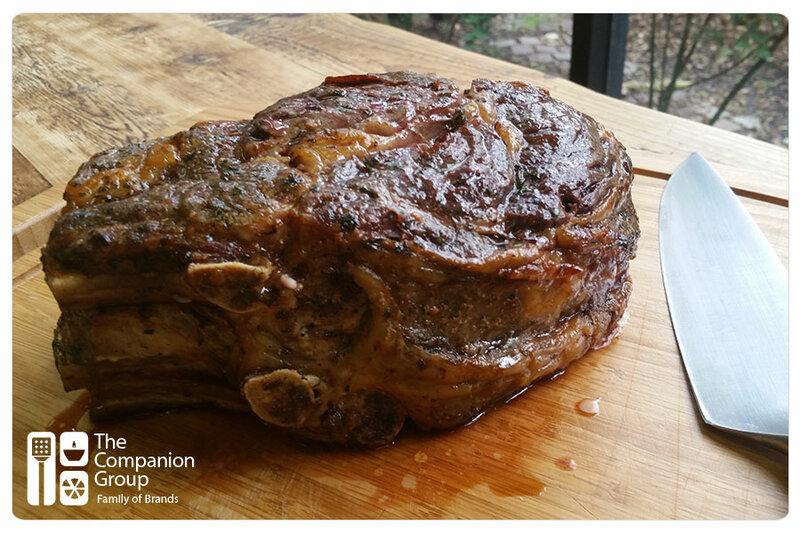 The rule of thumb for cooking time with prime rib is between 12-15 minutes per pound at 325°F. You’ll want approximately ½ lb. of meat per person for boneless roasts, and about 1 lb. per person for bone-in roasts. Flavor and nutritional value can depend on what food an animal was raised on. Grass-fed beef can contain more nutrients than corn-fed beef, but it can also be harder to find. On the other hand, corn-fed beef is typically cheaper and is said to be more flavorful than its grass-fed counterpart due to having a higher fat content. 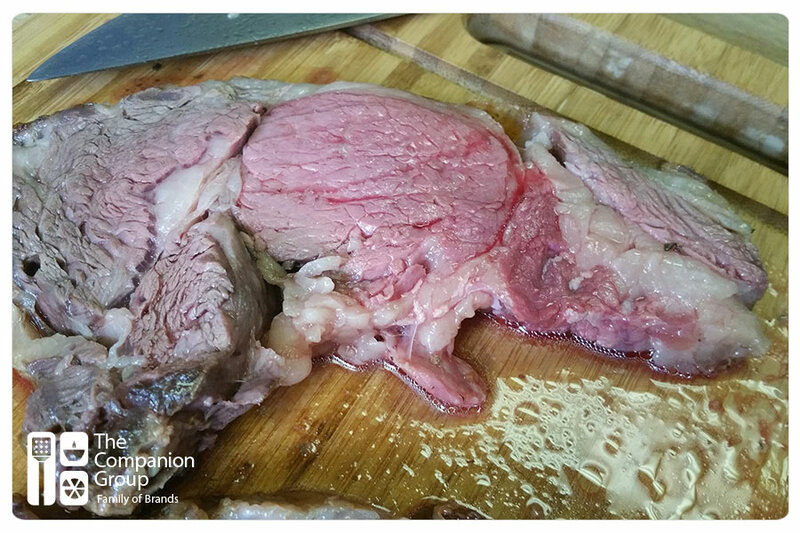 Aging also plays a big part in flavor when it comes to beef. Try to select a roast that has been aged at least 14 days but up to 30 or even 40 days. Aged cuts of meat can be more expensive than fresh cuts of meat, so purchase what your budget can accommodate. Begin by mincing garlic, thyme, and rosemary. Combine all ingredients in a small bowl and mix to combine. Place roast in a large turkey bag and add marinade. 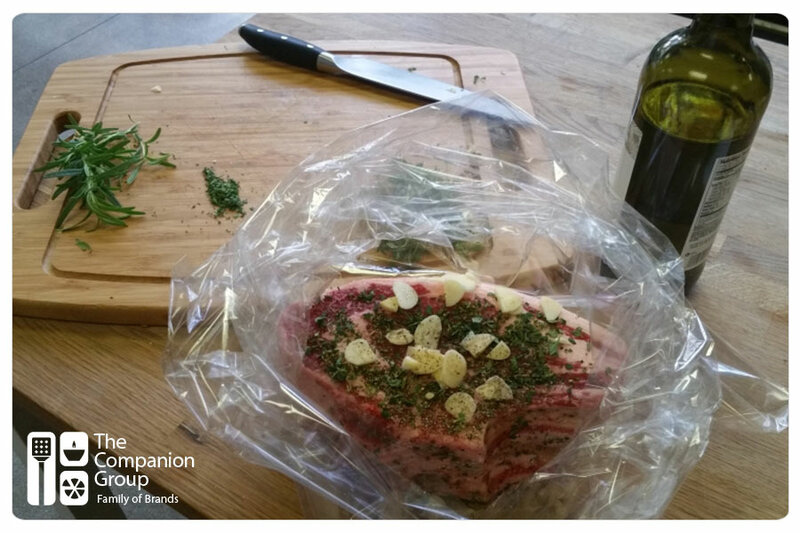 Close the bag with a twist tie and turn the roast so that it is fully covered in the marinade. Allow roast to refrigerate in marinade at least 4 hours or overnight if possible. Allow roast to rest at room temperature at least 2 hours before cooking. Once roast has warmed, place it on the rotisserie skewer and install forks to secure meat. Place spit into rotisserie brackets and turn on motor. Set one burner on each side of the roast on full flame, making sure that there is no flame directly below the roast. Roast meat for 12-15 minutes per pound at 325° – 350°F. For a medium-rare prime rib, remove the roast from the grill when temperature reaches 120°F internally. Allow roast to rest 30-60 minutes on a platter covered with aluminum foil. Making Bacon Bowls: Delicious and Easy!